Loading day started dry, which was very good news. The bad news was that, on arrival, there was an electricity supply failure on our quarter of the site. This was a big problem because the warehouses that we use have no windows, thus it was very dark inside. Seven twenty in the morning is also too early on a Saturday to interrupt anyone's day off work. However, by eight fifteen the head of site was busy arranging for someone to look at the very large generator that was supposed to provide us with light. Within an hour the day was going as planned. Thankfully, catering was well underway as they were cooking with gas. We have to get the priorities right! Tea, coffee and bacon butties kept everyone supplied with calories until lunchtime, when again the catering team produced a spectacular lunch. Thank you, if you provided some of the food we enjoyed on the day and thank you to the team who prepared and served it. The young people, let alone the older contingent, enjoyed the variety and quality of the food. It is a fact that Loading Day relies on a large number of people, many who we don't even know and only get to see in the photographs of the event. To everyone who took part, please accept a big thank you. By lunchtime the containers were over half full and we had a lot of stuff still inside the warehouse. This is panic moment when we wonder how many things we will be left over. The day had started well in the four containers, as TDG had fork lifted about thirty pallets onto the containers on the previous (Friday) afternoon. These included the tons of food in sacks, two generators, the boxes of books in Spanish and other very heavy loads. 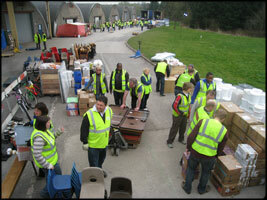 This meant the container teams had plenty to place and stack before they needed more items out of the warehouse. Supplying four containers with a flow of materials at the beginning of the day is very challenging. In fact, even this year, in spite of all the preparations, we were still working hard to keep up with the demands from the containers. The supply chain line went one way and within minutes a demand to chain to the other two containers was received. Everyone worked very hard but with such a will and enthusiasm. This is what makes the day such a privilege to be a part of. One of the first arrivals had travelled up from London and was on site soon after 7.30. Others arrived from Leicestershire, Manchester and Sheffield. Those that had travelled to be with us from Kent, Essex and Huddersfield had over- nighted locally. Full marks, as most people were there for eight o'clock, even me! By 5.30pm all containers were full, locked and prayed over. We had a lot of extra food this year, especially pasta, as the price went down to 20p. We have already started to buy for next year, as Asda is selling their value pasta at 9p for 500g and long dated at late 2012 or early 2013. We sent two generators for two rural schools, where the community has no electricity. Four second hand rotavators were sent out to help with the cultivation of the trees and seeds that we provided for the college and rural schools. We had a good year for children's shoes and wellingtons, also new pants and basic school supplies. We paid to have three quarters of a pallet of Spanish reading books road hauled from southern Spain. We had our usual supply of school desks and chairs, always a problem for the packers, and plenty of children's clothes packed in banana boxes, which the packers loved. We are very grateful to have achieved another excellent and safe loading day. Thank you to everyone who helped and to those who prayed. A superb team effort.